They’re only a couple of months apart in age, a year apart in school, and geographically, about three blocks apart. They had a sleepover this past weekend, and giggled all night. They woke up laughing, too! These two have been inseparable at family gatherings since forever! These pictures were taken at a party celebrating my father-in-law’s ordination as a deacon last month. I really should get their giggle fits on video! Here’s a candle I accessorized with the cardstock leftover from the layout, some ribbon, a couple of Primas, a corsage pin, and a Swarovski crystal. I picked up the candle at Michaels this weekend. It smells SO GOOD! This entry was posted in Stamped Stuff. Bookmark the permalink. Trackbacks are closed, but you can post a comment. I love that page. Your daughter and her cousin remind me so much of me and my cousin – we’re a year apart, but grew up like sisters and remain really close today. It is a very special bond they have! Love the A- girls page! And the candle is so cute! I love that page! The pictures are wonderful, and I love how you wrote in white around the edges of the photos! 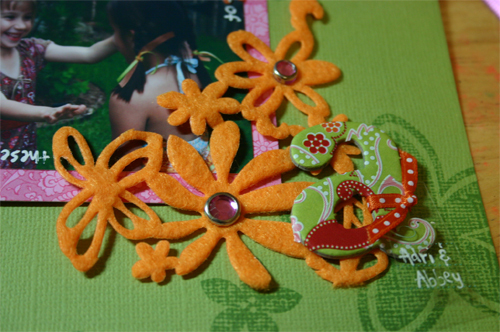 Love the flower accents and chipboard! 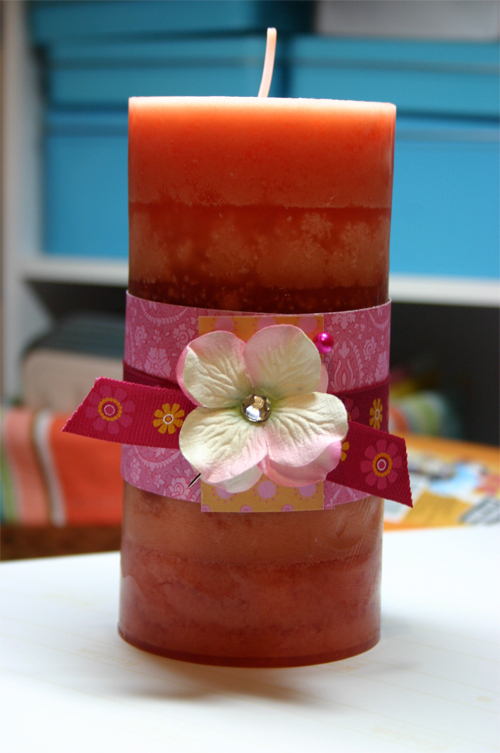 Your candle is so beautiful as well! What an adorable page that they can look back on and remember what fun they had as little girls. Great page for sure! I have that felt stuff in pink and black, but was NOT sure what to do with it, now I know! 🙂 Cute! The page is beautiful! Adri looks amazing in her dress and piggy tails. Your girl is growing up fast! what cuties! there’s nothing like your best girlfriend… especially when she’s family!